Original title in German: "Eine wahre Storchengeschichte"
In the early 1920s, one often saw a stork strolling solemnly around a farm in the Samland region of northern East Prussia. He was loved and cared for by the whole family. This friend of the household held a most special significance. At one time, the farmer’s son, then a 16-year-old youth, had found him helplessly hopping and fluttering on a meadow. It was not hard to catch him and carefully carry him home. 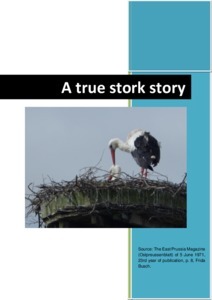 Under this loving care, the stork recov­ered well, but he was not yet up to managing the long flight south with his brothers and sisters. Being inside a warm barn throughout the East Prus­sian winter was very good for him. He spent the next summer sometimes in the farmyard, and at other times with the others of his kind. On this occasion, as autumn drew near, he went along on the journey south. Might he possibly return here when the next spring arrived? Yes, he did come back! He built his nest—as if it were self-evident—on the roof of the farm’s barn. Nor did he spurn the specially good morsels donated to him and his family. In the autumn he once more headed south. His one-time rescuer, however, had to go to the World War I. Taken captive by the French, he was sent to their colony in Africa, where he had to work in the fields. 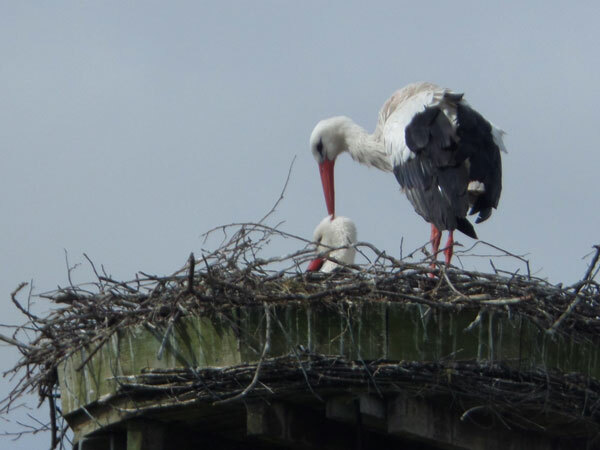 He was often tormented by home-sickness, especially when he saw storks heading north. “Greet my homeland for me, and greet my parents, too!“, he cried out after them. Then something remarkable took place. A large, beautiful stork aban­doned its flightpath with the others, and flew lower and lower, circling the prisoner before landing. Excitedly flapping its wings, it came straight for him. At that, the young man recognised the bird—it was his stork! He would have dearly loved to throw his arms around it, but was afraid it would startle the bird. The stork, though, approached him trustingly, even allowing itself to be calmly stroked. Tears came to the captive, who was suddenly seized by the thought—didn’t he have a piece of paper and a pencil in his pocket? Hastily, he wrote on a scrap of paper: “I’m alive!” and added his address. Again stroking the stork, he thrust the piece of paper deeply and tightly between the flight feathers, and also managed to wrap it around one feather. Would the feathers hold onto the paper? For many, many days? They really did hold it fast. Upon his arrival at the farm, the stork marched past the young man’s parents, again and again, so conspicuously close, until they noticed the paper and freed him of it. Speechless, they read what their son had written. “He’s alive! Our boy is alive!” They had had no news of him for a whole year. Now the father drove at once to the nearest military authority. His son was exchanged for a French prisoner.